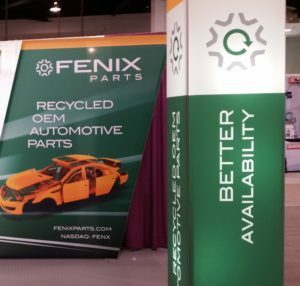 Rejecting a more than $10 million bid by a scrap metal facility as too uncertain and unrealistic, Fenix Parts’ leadership announced Feb. 28 it had agreed to accept a $8.1 million deal from a private equity company. If approved by Fenix’s shareholders, the purchase by Stellex Capital Management should add some muscle to the salvage operator which once had dreams of being a “strong No. 2” consolidator of recycling yards. Private equity has certainly done well for itself consolidating collision repair, and Fenix has argued that salvage yards were ripe for a similar trend. Mergers & Acquisitions magazine reported in October 2017 that Stellex plans to invest $100 million in the automotive sector, though its portfolio doesn’t include any yet. The company said in July 2017 that its first private equity fund had raised an $870 million war chest. “We seek to identify opportunities where we can deploy capital to provide stability, catalyze operational improvement and foster growth,” Stellex’s website states. The company was founded by two guys from the Carlyle Group, which owns Service King. For an interesting look at how one of them, former Service King board member Ray Whiteman, participated in the turnaround of a failing aluminum drivetrain company, see this 2012 Washington Post article. Fenix had run into financial and reporting difficulties, and it was eventually delisted from NASDAQ and sold on the “Pink Sheets” — speculative, high-risk stocks not traded on traditional major stock markets. The last reported common stock volume for Fenix Parts was 20,327,685 on July 20, 2017. Prior to an $0.50 offer by Upstate Shredding for the company, the stock traded at $0.27 a share, and Fenix said Stellex’s $0.40 came out about 56 percent above the two-month stock price average ending Feb. 9. Besides paying $0.40 a share for the 16-location Fenix (counting a Toronto site indefinitely closed following a fire), Stellex would take over $33 million in debt and another $7 million in other liabilities. Fenix has been cutting deals with creditors BMO Harris Bank and BMO Harris’ Canadian Bank of Montreal, from which it appears to have borrowed at least $21 million. The companies could have taken action against Fenix for failing to issue quarterlies and meet certain financial obligations, but had agreed not to do so until Feb. 28 — the day the deal with Stellex was announced. The lenders also had agreed to let Fenix add its 2017 interest payments to its principal and defer the principal payments owed until Feb. 28. Fenix said in its Feb. 28 news release that it expected to sign a new extension that day. Fenix’s board of directors has unanimously approved the deal, and proxies are being sent to shareholders. The company expects the Stellex deal to close next quarter. The directors also didn’t want to risk the Stellex deal bird in hand for a less sure thing, the company said. Fenix also wrote that director Thomas O’Brien, a former longtime CEO of Insurance Auto Auctions, had stepped down prior to the announcement “due to a potential conflict related to his pending acceptance of a Board position at an industry-related company” but voted in favor of the merger. PartsTrader announced Friday that O’Brien would become its chairman of the board.